There was an overwhelming amount of angst around campus during this uncharacteristically hot year. A petition was created on PawPrints that spread among the student body like wildfire, receiving a staggering 663 signatures. The petition mentions how difficult it is to be academically and socially successful whilst in an uncomfortably hot living space, such as that which was experienced early this semester. Although the weather might have cooled for now, several students weighed in about the uncomfortable temperatures in the earlier weeks. “I believe that everyone should have AC,” said Emily Carter, a first year ASL-English Interpreting major living in Mark Ellingson Hall. While she has air conditioning, she sympathized with those who did not. “My friends who don’t have AC are suffering from migraines — they can’t sleep; they are extremely uncomfortable,” she said. While Carter had heard of the petition, she had yet to sign it. First year Biotechnology and Molecular Bioscience major Eryn Harrington on the other hand, knew all too well the struggles of life without air conditioning and had already signed it. Harrington and Carter have experienced much discomfort due to the heat, and they aren't alone. “Many people feel the same as I do. A lot of kids are complaining,” Carter said. "The people who don’t want to pay for our AC aren’t the ones living in the dorms." Rochester is one of those places that gets cold fast. Already, temperatures have begun to drop rather dramatically. Is AC really worth installing for just a few hot days? "When we get to school, it's really hot for the first month,” Carter acknowledged. “Also, in April and May it gets hot again." Despite the short term heat, though, she felt it was still unacceptable to go without air conditioning. "Having to deal with that is not okay,” she said. Not only has there been an excessive amount of complaints about the lack of air conditioning in the residence halls, but many academic buildings are also going without. Four students passed out from overheating in James E. Booth hall. Harrington had a different approach. "It doesn’t matter how many people passed out, it’s preventable. [RIT] should put in the money for that,” she said. RIT is open to hearing suggestions as well as taking care of our needs. They just want us to express that to them. "Your students come first — and so does their health,” Carter said. Harrington mentioned her parents are alumni from about 20 years ago. When they helped her move in they said that the residence halls hadn't been renovated since they were here. This was later confirmed by John Moore, vice president of Facilities Management Services (FMS), but they plan on doing renovations soon. John Moore, himself an RIT alum, provided a history of RIT's air conditioning journey. The standard construction for buildings in the 60s was sans-air conditioning. 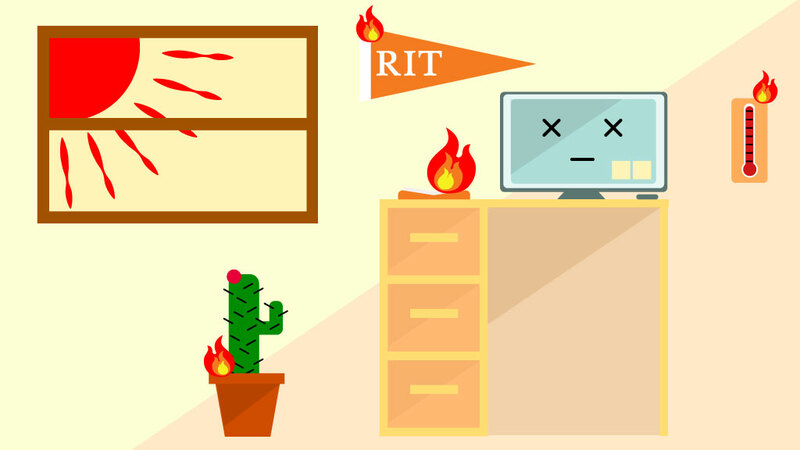 As enrollment in summer programs has risen, however, RIT has built more buildings with air conditioning. They have added air conditioning to some academic floors that have labs, and given partial air conditioning to Gosnell. In the future, they are planning to finish Gosnell, as well as Booth and Frank E. Gannett Hall, which are also not fully air conditioned. When exposed to the upset of the students, Moore had some strong response points. Moore said the panel needs to see its value and justification. “Would it be worth spending money on one thing, or would it be more profitable to spend those funds elsewhere?” he asked. He then explained that air conditioning is something that would be highly expensive. Residence Life has to justify the installation of air conditioning and prove its importance to the university. Moore also had an analogy for this issue. If you use an expensive car as an example, how much money would you invest into a car if you knew you were only going to drive that car a few days out of each year? While this school has very good financial and academic standards as one of the largest and most successful private universities in the nation, it still must maintain a close eye on its budget in order to maintain its financial safety. "How can you be successful if you can’t sleep or study in your own dorm room?" As far as the petition goes, Moore appreciates the amount of attention it has received. Such attention gives real weight to the issue. The amount of signatures does not surprise him because he knows how uncharacteristically hot it is. He also recognizes the length of time that has passed since the last time the residence halls have been renovated. “The residence halls we try to renovate every 20 years or so. We will be improving them soon [and] the question of AC is something we definitely need to start thinking about," he said. "We will also be seeing improvements in the apartments at Riverknoll." "Make sure that your information and feedback is provided professionally through Residence Life." Moore said that the rest of the university will also experience a number of tangible changes over the next couple of years. For starters, the construction of the cyber security building should be finished by Oct. 1, 2020. Renovations will also be seen across Saunders College of Business's Max Lownethal Hall as well as various parts of NTID. For further improvements, Moore really leans on student feedback. Many projects undertaken by FMS have gotten their start through student advocacy. Students are still Moore's top priority, despite tight budgets and other difficulties.